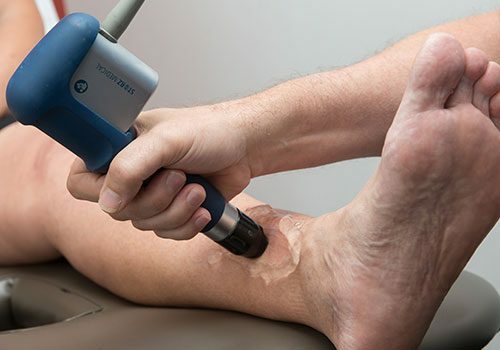 Extracorporeal Shockwave Therapy is a non-surgical treatment used in orthopaedics, physiotherapy, and sports medicine to improve circulation and accelerate recovery. During Shockwave therapy, we direct high energy acoustic waves into injured tissues for treatment of painful subacute and chronic conditions. These waves promote the regeneration processes in muscles, ligaments, and tendons to reduce pain, increase blood flow in the tissues, dissolve calcifications in soft tissues, and help restore your overall mobility and function.